Messing about in boats on canals narrow and canals wide #narrowboat #england – The Diesel-Electric Elephant Company. Well there was a morning’s boatering for you, yes indeed. When last I moored (Barbridge Junction) there was traffic and only one spot remaining so I done grabbed it, and this left us (the Cardinal and me) facing in the wrong direction. This morning I took advantage of this, went a couple of miles up the Orinoco for services, turned and began to pootle south. Ended up on moorings in the middle of Nantwich. Like all of the “xxxxwich” towns it owes its existence largely to salt. Nantwich dates from Roman times, when it supplied …salt …to the Roman garrisons at Chester. During the Norman conquest (11th century) the dastardly Normans burned Nantwich to the ground, leaving only one building standing. It burned again in 1583, and during the English Civil War the town declared for Parliament, and was consequently besieged several times by Royalist forces. It has a population of roughly 18,000 and is notable for having one of the highest concentrations of Listed Buildings in England, sporting some fine Tudor and Georgian piles. The town centre is fighting a desperate battle for life, but it must be said is heading towards “fur coat and no knickers”, while the outskirts have been lost of late to ticky-tacky new-build housing. The Nantwich canal aqueduct, which is wot I have just crossed and am moored near to, dates from 1826 and is one of Mr Thomas Telford’s cast-iron creations. I wish that he had installed traffic lights – with mature trees obscuring the view, approaching the single-boat width aqueduct via the curve to the north is a leap of faith. The Nantwich Aqueduct. 1826. Thomas Telford. Cardinal Wolsey crossing. Admiral Hutson at the tiller. The Nantwich Aqueduct from ground level. On a boat you cruise merrily across, looking down on the motorists cursing the large junction below. The Cardinal and I mooched from right to left in this photograph. How did I celebrate our arrival in this lavish little puddle of history? I found a cashpoint machine (first I’ve seen for some six months, they don’t put ’em near canals, usually), I bought chips from a chip shop, and I hit up a couple of charity shops for book and DVD bargains. The town even has a Holland & Barrett so I called for a couple of items, but, being Holland & Barrett, both Slug Juice and Toadflax Concentrate were, of course, “out of stock, Sir”. I know how to wallow in culture. Getting us here involved a tad more interaction with those watchermacallums …those “people” thingies, than I would have preferred. A couple of emergency stops at blind bridges, some shallows and some stretches of wide canal as contrast to stretches of uber-narrow canal. The approach to the Nantwich Aqueduct. The wide-angle of the camera is deceptive, once all 57′ of the Cardinal is on the bend if there were to be a boat already on the aqueduct (to the right, behind the trees) then there really is very little in the way of options in re where to put oneself. Today’s photographs are all very random, I have to explain, but they do give you a driver’s eye view. I shall sleep – if sleep I do in this connurbation – to the sound of whalesong tonight. The fenders are rubbing against the armco of the towpath and are producing what can only be fluent gibberish in humpback whale language. They usually only do that when the weather is damp, I have no idea why they are singing here. In short, to wit, we are serviced, and we have begun our journey around to the other side of Middlewich – at canal velocities, of course. Yesterday I managed to completely re-work the plot of “Miss Givings’ Narrowboat Brothel”, so while moored I must get my proverbial thimgummy in gear and get on with that. Doubtless the plot will change again before tis finished. It occurred to me that I was initially trying to write about London and wotnot, quite out of my familiarity zone, so I have changed that to a more generalised and much more adaptable “the north”, where I at least have an inkling of what I am putting my characters through. This version is also far less likely to get me sued for putative libel. It is a much more simple plot than hitherto, and that is always a good thing. Keep your fingers crossed for me that this particular embankment doesn’t go the way of most other embankments that I have patronised, and that the Cardinal and I are still at rooftop-height in the morning. There is a statutory responsibility to keep Nantwich embankment, and Aqueduct in good state of repair, due to the fact that there is a report stating that if there is a failure, there WILL be loss of life!! Spiders on the other hand. We don’t kill or chuck them overboard. They are pretty good at ridding the boat of more nasty creepy crawlies. The cat, on the other hand, will quite happily chase, play, then kill them – She then guiltily hides them under the rug (I don’t think she likes the taste). My goodness. That first picture strikes me as the canal version of an 6 lane highway. But that aqueduct is jaw clenchingly narrow. Although, I suppose it is better that there is NO space because there is always an idiot who thinks there is enough space when there isn’t. Youtube is filled with the amusing idiocy of such jackasses. I would not want to meet one on an aqueduct. That first picture shows a huge span of water I hadn’t realised you could get on the canal system. Quite a day of travelling really, must make you very tired. I remember being in Chester once on a training thingy and someone mentioned Nantwich as being a hot bed of wife swapping, don’t know whether they were being amusant or not! Still that’s okay if you’ve got one to swap; I never did ask what the going rate was. Happy writing! 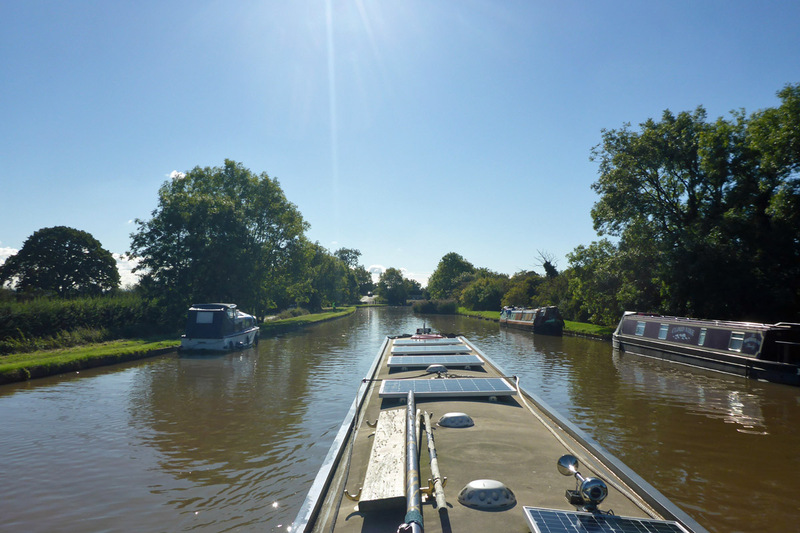 It is surprising, most of the canals hereabouts are narrow and getting narrower as less and less mainenance is done on them and the offside vegetation creeps across to block the way. It’s just as off-putting when I suddenly come upon a (relatively-)vast expanse of water! Thank’ee kindly, sir, tis all good fun – or it would be, if this weren’t the biannual season of capturing and chucking overboard enormous spiders… just wrestled with another one, this time in my sleeping cabin. I really, really need someone to deal with them for me! I often wonder that myself. Smaller ones fly of course, travelling on their strands of web nonsense in the breeze, but like you, I suspect that the big ones run up and down the mooring ropes carrying their suitcases overhead. Spiders rank right up there with wasps as far as I am concerned, but these days I gird my loins and catch & eject them rather than belting them with a rolled-up midshipman. I wonder why the human dislike of insects is so deeply ingrained and visceral? Aside from the fact that insects are vile, disgusting creatures of course!